All seams are hand glued and then pasted by quadruple overlap i.e. Additional fabric is glued at the edge of each panel junction as well as a strip inside all assembled panels in order to ensure a perfect watertight quality preventing from any leakage. Each inflatable boat is handmade through cold cure adhesive pasting method. Standard accessories: foot pump, repair kit, valise, paddle. Weight of person considered: 82.5 kg average. Boat material: 1670dtx polyester support fabric coated with hypalon outside and neoprene coated inside. The inflatable boat design complies with ISO 6185-3 approved by IRS. Dimensions are nominal in meters. Inflatable Rescue Boat 450 is made of impermeable, light weight polymer coated fabric 1670dtx 1500 GSM. Highest standards of safety are adhered to. It is capable of carrying out most boating activities like Diving Operations, Transportation of men & material, Search & Rescue Operations better than the rigid boats of equivalent type. 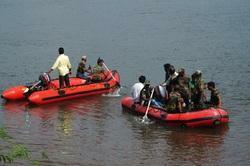 Transportation of men & material, Search & Rescue Operations better than the rigid boats of equivalent type. Heavy Duty Inflatable Rubber Boat for use in Rivers & Sea the boat is capable of carrying out most boating activities like Diving Operations, Transportation of men & material. These inflatable are made of impermeable, light weight polymer coated fabrics are available in a wide range of colors in capacities from 4 to 12 persons. Highest standards of safety are adhered to. Weight of person considered: 80 Kg average. Boat Material:Rubber coated ( Hypalon / Neoprene) material products. Denier of Tube Fabric/ Floor Fabric: 1670 dtx Hypalon & Neoprene, 1500gms/m2. Boat Material: Heavy duty Nylon fabric coated with Hypalon in outer and Neoprene inner side. Looking for Inflatable Rescue Boat ?